Welcome to my blog if it's the first time you've visited and welcome back if you've dropped in before. 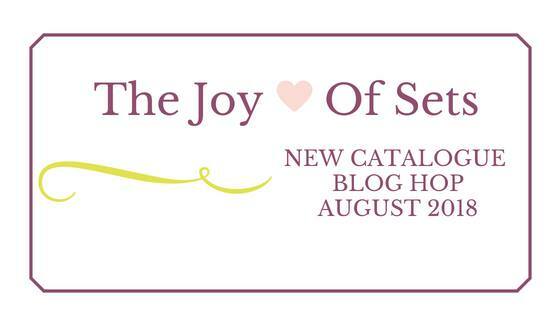 I am so delighted to be taking part in the Joy of Sets blog hop again. 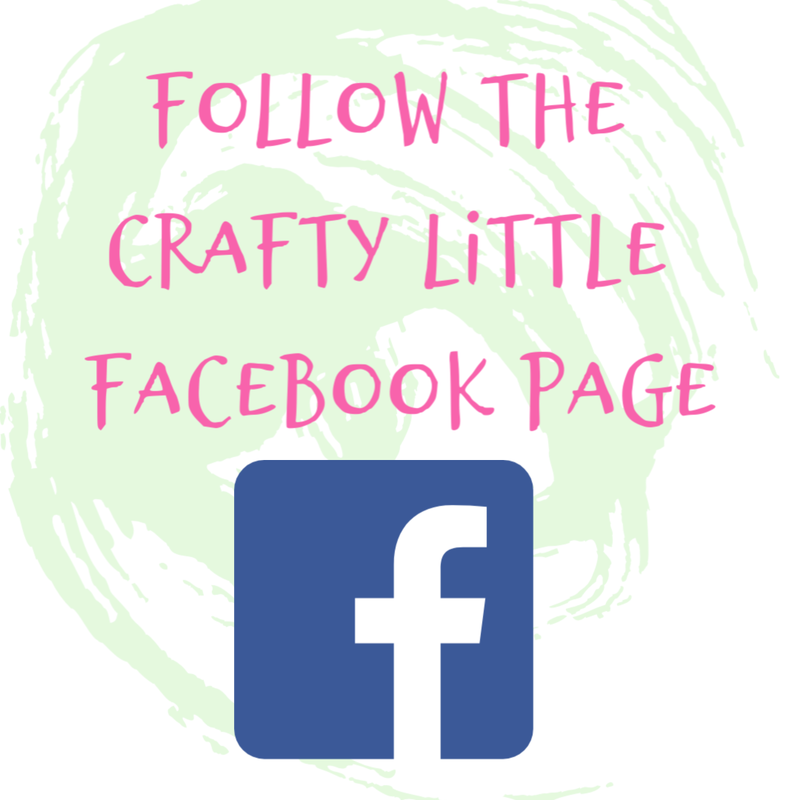 What a tremendous group of crafters there are over on the fab Facebook group. Huge thanks to Fiona and helpers for organising this for us all. Please go and check out the other projects by clicking the links below. So, on with the project. 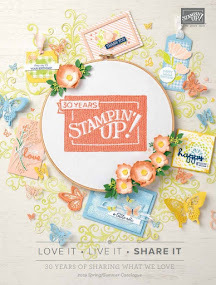 We were asked to CASE something from the new Stampin' Up! 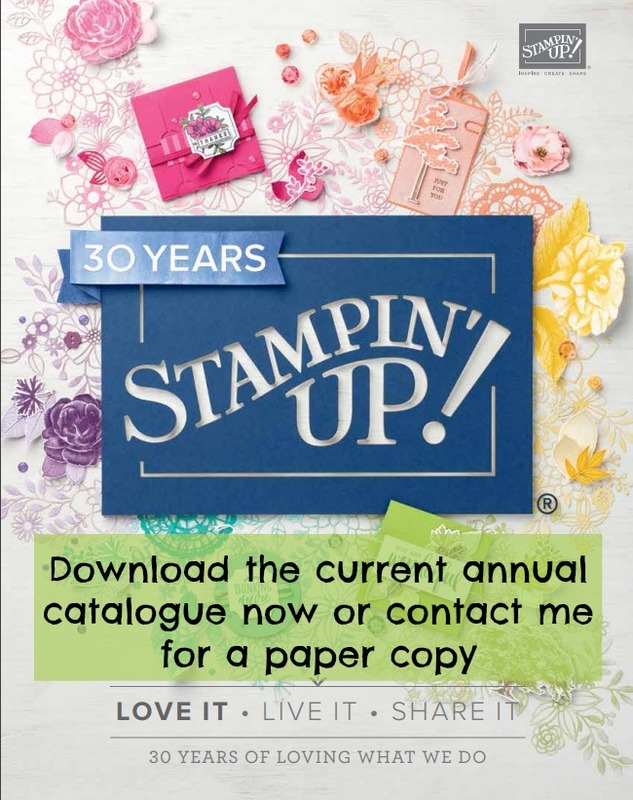 annual catalogue EDIT: Actually we weren't but that's what I got stuck in my head, we were asked to showcase a product but I think I did that anyway... phew! It was as simple a remit as that. We didn't even have to muster up creative energy of our own, it was a simple copy and share project... we now know it wasn't but let's just roll with this. We didn't have to use new this year stuff either, so even if we'd not gotten around to making an order yet we could still join in if we had some carried over stash to play with. 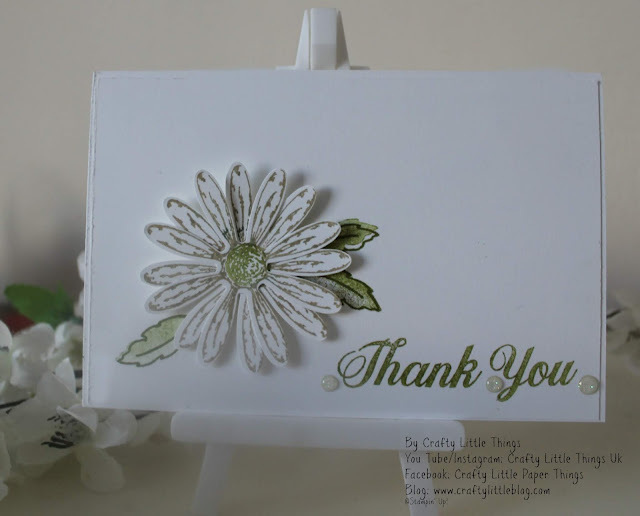 I flicked through the catalogue, as my upcoming video tutorial for this project may show, and eventually decided to go for this gorgeously simple card using the Daisy Delights stamp set and Daisy Punch. The reason I chose this was because it is so simple and elegant and I wanted to see if I could make an almost all white card without smudging something on it that shouldn't be there (almost achieved) and also because I went crazy for the daisies last year like a lot of people did and haven't used it that much since. It was time for a revisit. Another reason has to be because I just love green and white together, especially an olive green, I just find it so fresh and relaxing. My card is a folded 8 x 6 inch piece of Whisper White for the base and I wasn't sure if they stamped direct onto the card base or not so chose to print onto a Whisper White mat which was just an eighth of an inch shorter than the 6 x 4 card base on each side. I think the catalogue version used Soft Suede or Sahara Sand to stamp out the two daisies but I don't have either ink so I improvised with good old crumb cake and used Old Olive for the centre. I eventually stamped and punched two daisies. In the video which will be available to view tomorrow, I somehow managed to miss that there were two overlapping daisies until the very end... I blame the sunstroke. I used Old Olive to stamp the leaves before attaching the flower and I stamped off once to get the outline and then with the fill colour stamp I stamped off once then stamped all three without reinking. I like the subtle difference that created. I used the sentiment from the same stamp set and stamped this using Old Olive which again had been stamped off once first to mute the colour just a little. As I'd failed in managing to present a pristine white project I had to add a couple of retired gems to the card to cover up my splodge of Old Olive between the two words. 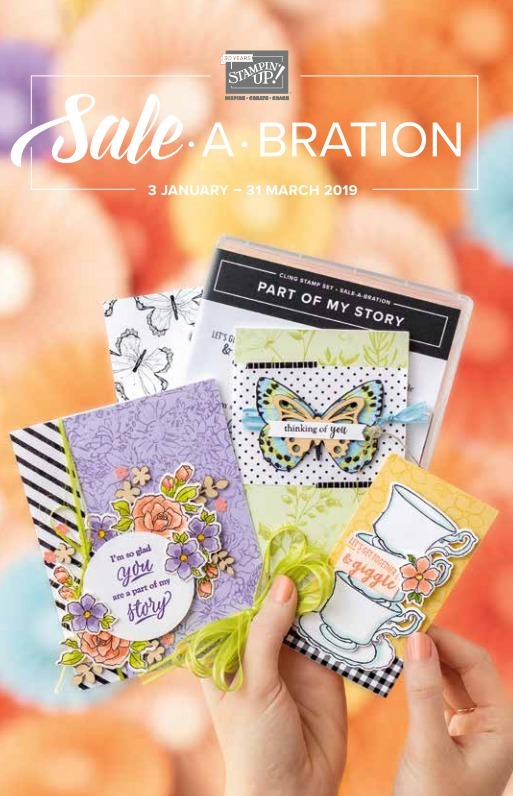 So this detracted from an exact replica of the catalogue version but apart from that and the use of Crumb Cake it pretty much is the same as the gorgeous catalogue offering. Give it a go yourself and be sure to click onto the other projects in the hop. 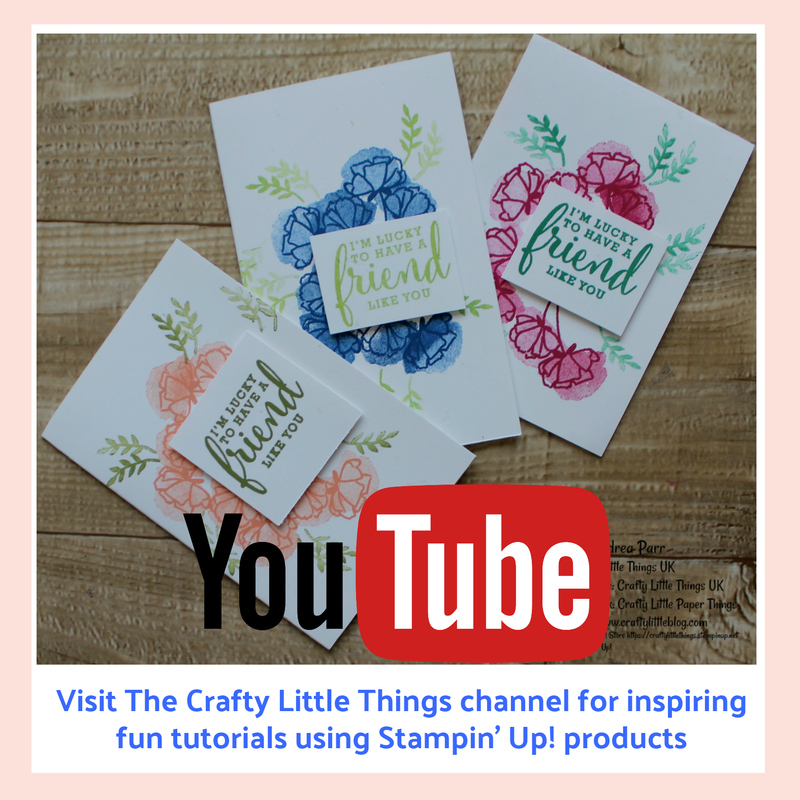 Don't forget to subscribe and follow to show some support and love to the ladies taking part. 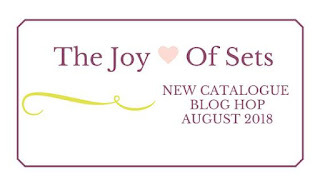 If you fancy joining Joy of Sets pop in a request to join and I'm sure the admin will sort it out pretty quickly. 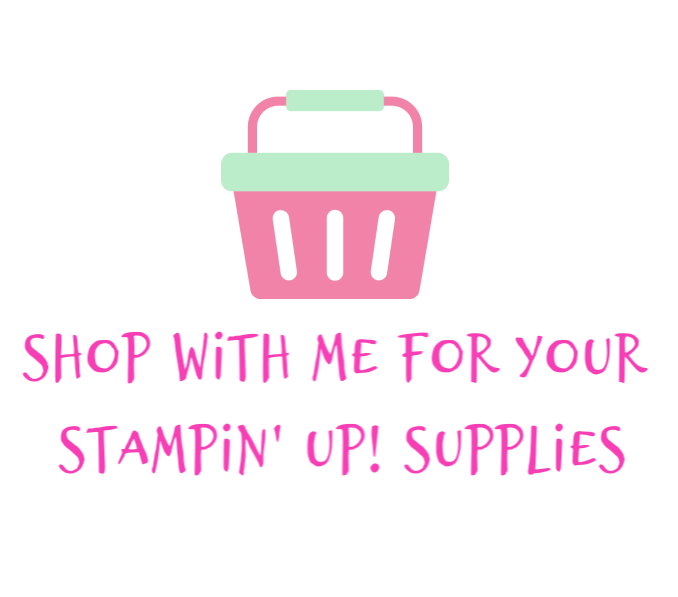 It is a secret group simply because it has an address file for RAK's and swaps so you do have to request to join but it's a fabulously friendly group and you can use any brands you like although the main focus is on Stampin' Up! Lovely card Andrea - all white cards can be very tricky and I know the feeling - I often have to add an embellishment to cover up some smudge or other. Thanks for being part of JOS and joining in with the hop. It's been such fun, thank you for arranging it. I love your clean & simple card, even though I'm sure it wasn't all that simple to make!!!! Lovely card, Andrea! Such a pleasure to hop with you today! Thank you and like wise. The creations are fabulous, I love an event which brings a community together from around the world. What a gorgeous, simple card Andrea. Love it! Thank you Jackie, a white and green combo gets me every time. Such a lovely clean and simple card TFS.